Today the Transportation Security Administration (you know ’em as TSA) began allowing travelers to apply for its PreCheck program (or as TSA calls it, Pre✓™). 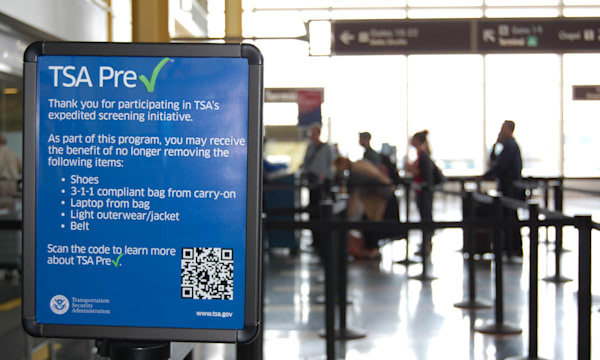 The new application process allows U.S. citizens to directly enroll in TSA Pre✓™, an expedited screening program that allows travelers to leave on their shoes, light outerwear and belt, keep their laptop in its case and their 3-1-1 compliant liquids/gels bag in a carry-on, in select screening lanes. To date, passengers have only been eligible through existing programs such as U.S. Custom and Border Protection’s Global Entry program and frequent flier programs with certain airlines, but this announcement will allow travelers to apply directly for the expedited screening program. Travelers can pre-enroll at tsa.gov. But to complete the process, they’ll need to complete a background interview at a participating airport. Currently the only participating airport in the entire country is Indianapolis International Airport. So, here’s AOL Travel’s Indianapolis travel guide. TSA expects to open application centers in the New York City; Washington, DC; and Los Angeles areas later this month. It plans to eventually open more than 300 centers around the country. But for right now, Indianapolis. An airport with just one terminal, no tram, zero VIP lounges and woeful public transportation options is the best in North America, according to the Airport Council International. Last week, Indianapolis International Airport beat out every other large facility on the continent for the top Air Service Quality award for 2012. The results are based on passenger satisfaction, and IND won for the second time since opening in 2008. If you’re scratching your head, that means you’ve never been to IND. The first thing you notice upon landing is that the architects didn’t stop designing at the back of the terminal. Most airports greet arrivals with a cluttered mess. IND makes a striking first impression with a towering, glassed-in terminal overlooking the tarmac. Inside, the space is contemporary, bright and calm. The layout is so intuitive that you rarely look for signage. You can see outside from every spot except the restrooms. Many of the restaurants are satellites of better local independents. There’s none of that stale, claustrophobic, generic feeling common to airports, nor is the scale so massive that the place feels deserted. If you’re renting a car, you don’t need to board a van or shuttle – all of the vehicles are parked in the adjacent garage. You get in and out of the airport quickly and see some bold art installations along the way. But even gorgeous airports never transcend their function. At best, they manage not to ruin a trip. So after landing at the continent’s best airport, then what? Indy is in the midst of an urban renaissance, and you don’t see it coming. I’m a local, and here’s how I show off my town to guests. %Gallery-183028% Walk or bike the Indianapolis Cultural Trail, a brand-new, $63 million path. While most recreation trails lead out of town, where people can exercise on a stretch unbroken for miles, Indy’s does the opposite – the pretty promenade laces through the heart of downtown, replacing 8 miles of sidewalks. It passes every major attraction and cuts through every neighborhood. You can rent wheels at the Indy Bike Hub and spend two hours getting an overview of the city from a bike seat. The trail connects to another one that runs along the back wall of the Indianapolis Zoo, and sometimes the animals make themselves heard. Make pit stops at the Central Library for the best view of the city from the sixth floor, and at the NCAA Hall of Champions museum, kicking off the 75th anniversary celebration of March Madness this month. Ride to Fountain Square, Indy’s hipster core, and find the special stoplight for bike traffic. Stretch your legs by getting lost inside the Murphy Building, a loveable shantytown of small art galleries and studios. Make sure to find People for Urban Progress‘s quarters and buy the best souvenir in town: tote bags, iPad cases and wallets made from either salvaged Super Bowl signs (right) or the fabric roof of the city’s former football stadium. Have lunch on up-and-coming Virginia Avenue, which connects Fountain Square to downtown. Go locavore gourmet at Bluebeard (below), a hot new restaurant that pays tribute to native son Kurt Vonnegut, or street Mexican at Tortas Guicho Dominguez y El Cubanito. Next, it’s on to Speedway, home of the Indianapolis 500 in May. An influx of European racing teams has added a stylish subculture to the gritty town. At the new Dallara IndyCar Factory, sign up for a ride in a real open-wheel racecar – it costs only $30 for a spin through city streets, which is a bargain compared to the $499 ride on the Indianapolis Motor Speedway itself. If there’s no time to tour the state-of-the-art factory and try out the racing simulators, at least get espresso at Lino’s Coffee, an Italian import inside the building. You might find yourself in line behind a former Indy 500 champ. Not far away is the Indianapolis Museum of Art, one of the 10 largest encyclopedic art museums in the country. In the last few years, the IMA has built a significant contemporary art collection; the curator represented the U.S. at the 2011 Venice Bienniele, a huge honor in the field. A big part of the renaissance is 100 Acres (below), a new contemporary sculpture park on the museum grounds. Here, installations are integrated into woods, meadows, and lake. You’ve never seen a fishing pier like the one here. It’s hard to believe that admission to both the park and museum is free. Like I said, you don’t see it coming. “Restroom?” the guest asked near The Alexander hotel’s registration desk, a pair of antique bureaus encased in glass. “Follow the birds,” the employee answered, referring to a flock made of sculpted vinyl records fluttering along a lobby wall. “Follow the birds” and “just past the graffiti” might become common directions at Indianapolis’s new boutique hotel, located three blocks from Lucas Oil Stadium, the site of last year’s surprise-hit Super Bowl. Visitors are arriving not only to check in, but also to check out a remarkable collection of contemporary-art installations, from the aforementioned graffiti by Banksy rival Nick Walker to an entire bar designed by Jorge Pardo, a MacArthur “genius” award winner. The street-level vestibule and second-floor registration area serve as a de facto museum gallery, complete with flat white placards on the walls. The first work guests see is Brooklyn-based Alyson Shotz’s vertical wave of acrylic strips that reflect a shifting rainbow spectrum. Next, pendant lights that look like jewel-toned jellyfish dangle above a long staircase to the registration level – those are Pardo’s, and they lead to a swarm of the same fixtures in the lobby bar. %Gallery-178921%Three more large-scale works anchor the lobby, each referencing local culture. In what might be viewed as a clever way to get you to stay an extra night, several pieces make you stop and study their intricate details. You’ll want to “read” a lacy metal curtain of laser-cut words that represent Brooklyn artist Mark Fox’s impressions of Indy, and continually step close to and back away from “Madam C.J. Walker II,” a portrait composed entirely of 3,840 black plastic combs; up close, the technique astounds (artist Sonya Clark of Richmond, Virginia, broke teeth from some of the combs and layered them to create shading), and from a distance, the image of the namesake woman comes into focus (Walker created a cosmetics empire in Indianapolis in the early 20th century and became the country’s first female African American self-made millionaire). The Indianapolis Museum of Art, which claims one of the 10 largest encyclopedic collections in the country, curated the hotel’s installations, as well as photos and murals for every floor and guestroom. The museum’s involvement sets The Alexander apart from other art and design hotels, most of which fill one of two niches: an owner’s personal art collection not related to the site, or surreal experimental architecture. The Alexander, operated by New Jersey­–based Dolce Hotels and Resorts and named for the architect who platted Indianapolis in 1820, opened January 21 as a mid-size property targeted largely to business travelers. It boasts 157 guestrooms (each has dark-wood floors and a seek-and-find mural behind the coffee station), 52 extended-stay suites, an innovative local restaurant, and Pardo’s artisanal-cocktail lounge. Located a block from the Indiana Pacers arena, it’s also catering to visiting NBA teams with California king beds in many rooms. The tactic worked: The Brooklyn Nets were among the first guests, though the hotel evidently made them a little too comfortable because they arrived at an ungodly late hour and still managed to beat the Pacers later that day. With some weekend rates well under $200 and a prime location near the city’s new $60 million Cultural Trail recreation path that ribbons past every downtown attraction, The Alexander is poised to draw plenty of leisure travelers, as well. Those captivated by the artwork will want to venture four miles north and check out the museum’s other public-art showpiece, 100 Acres, an art and nature park with al fresco contemporary installations, opened in 2010.